AFRICAN AMERICAN REPORTS: Will you be buying Omarosa's book on her time in the White House? Will you be buying Omarosa's book on her time in the White House? 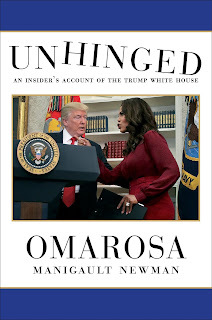 It was a foregone conclusion that ousted Assistant to the President, Omarosa Manigault would write a book about her brief time in the Trump White House. Well, that book, 'Unhinged: An Insider's Account of the Trump White House' is set to be released August 14, 2018. Now, the book will probably sell very well, but I won't be one of those buying it. I can't in any way support this woman who would sell out the entire African American community and was only in the whole thing for a title, and the money that would come after she served in Trump's administration. I want to read the book, but I won't be paying for it and enriching Omarosa, maybe I'll get it at the local library, borrow someone else's copy, or wait for the Lifetime movie. Will you buy the book?